Service Costs > How Much Does It Cost to Rent a Porta Potty? Porta potties are temporary portable toilets that can be used for any outdoor activity such as a concert, construction sit, festivals, weddings or a home party. The purpose of renting a porta potty is so that the guests will have somewhere to use the restroom in case there is no building that offers one. On average, renting a porta potty can cost anywhere from $50 to as much as $275 for one day. The more units you rent, the lower the “per toilet” average will be. The cost of one will depend on the kind you want, how long you want it, time of year, the number of people attending, where you live and geographical region. For those who need a porta potty on a monthly basis, the costs can be anywhere from $100 to $400 per month. According to Porta-pottyrental.com, their porta potty rental rates can range anywhere from $65 to $95. Here, for example, a one-day rental on the weekend for one potty with no additional cleaning service costs $75. Two potties with no additional cleaning service retail for $70 and three potties with no additional cleaning service will be $65 each. Another potty rental company, Castle Party Rental, rents out units according to categories. An economy portable toilet costs $100. A deluxe portable toilet is $150, while a VIP portable toilet is $200. An ADA portable toilet for handicap people is $150 for the day. This infographic on PortaPotty.net says a straightforward rental could cost $175 to $225 per day, whereas a deluxe toilet could cost $395 to more than $795 per day. Porta potty units are delivered and picked up by the rental companies, and this will often be included in the estimates mentioned above unless otherwise stated. They will be put in place wherever you direct. A basic, economy portable toilet includes a seat with cover, toilet paper dispenser, doors that can be locked and with “in use” or “open” indicators, and a few wall vents. Deluxe portable toilets include all those mentioned above, plus a paper towel dispenser, hand soap dispenser, mirror and a foot-operated sink. VIP units come with all of the above plus a foot-flushing toilet and an interior light fixture. An ADA Portable Toilet is rented out with features that meet state and federal guidelines, including stainless steel railings inside of the unit for support. These units will be ADA compliant and will be larger than the standard units. In addition to the standard frequency of cleaning and servicing mentioned, a small unit cleaning charge may be applied. If you are renting the porta potty on a monthly basis, you will need to have it cleaned at least once a week. Each cleanout can cost about $50. Some units can have a built-in sink installed for an additional $10 to $25+. A portable handwashing station can be rented as well. These stations can be placed outside of the porta potty units. Disinfecting hand sanitizer and a water hand-washing unit are available for an extra charge. Depending on the company, some may charge a small delivery fee, especially if it’s outside their mileage zone. It is a good idea to have an air freshener of some type in the porta potty to keep it from smelling foul. Most companies will deliver the porta potty with a full roll of toilet paper but any additional toilet paper will have to be purchased. In some states, a permit may be required if you plan on holding it for more than 30 days. Check with your local city to see if they require one. Avoid any hidden service fees by stating what exactly you want and placing reservations ahead. Do not allow rental companies to sweet talk you into renting more units than you really need. 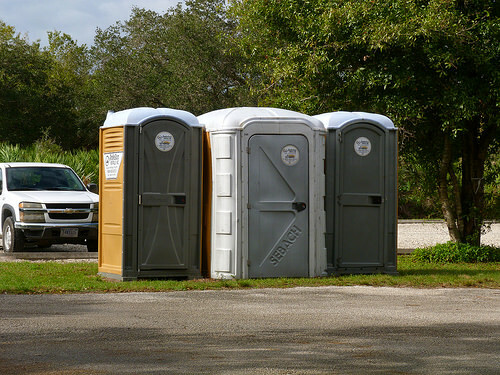 Though porta potty rentals are quite costly, the convenience that you get is unequaled. It may even come out cheaper to rent a porta potty than to hire a janitorial service to clean the restrooms on a regular basis. About 10 people can use a porta potty each day during the course of a 40 hour work week before it will require cleaning and servicing. It is best to have one porta potty for every 50 to 65 people. The more portable toilets you need, the less you are going to pay per toilet. You will also save money per day by renting the porta potty for a longer period of time. If you are in need of the porta potty on weekends only, for instance, it may actually be cheaper to simply keep it full time since it will not have to picked up and delivered multiple times. Since there’s a good chance that there are a lot of companies in your area, try to get a handful of quotes over the phone or the Internet.